Your physician brand is not only how you market yourself to potential employers, but also how you are perceived by colleagues, industry partners, and even patients. When considering how to define who you are as a doctor, it is important to consider all of these “customers” and how your unique attributes could appeal to or even deter each group. For this article, we will be focusing on how to brand yourself for your job search, but the categories will also apply to the other segments. As a physician, your skills and expertise are clearly in demand. However, it is important to keep in mind that being in demand doesn’t guarantee your ideal job. 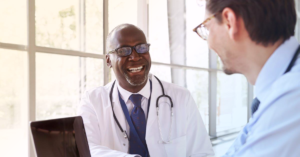 In fact, now more than ever, organizations are digging deeper to make sure any physician they hire is a strong fit professionally and culturally. One of the ways that you can set yourself apart as a candidate is to create a personalized physician brand and use it to sell yourself to potential employers. To create your brand as a physician, it is important for you to spend some time in self-reflection. Naturally, part of your brand is your specialty, but your personal characteristics will be what employers are looking for. Your brand should tell potential employers and colleagues about your career goals, personal and professional values, your lifestyle, etc. Taking the time to understand yourself (and what is important to you) facilitates the development of an authentic brand. Here are a few things you should ask yourself to best define and understand your own physician brand. Things that you are passionate about, both work-related and personally, are the things that get to the heart of who you are as a person. Any healthcare organization that is going to make an investment in you wants to know what is important to you and how it shapes you as a person. What are the things you do better than others? This isn’t defining your specialty. Your education and experiences can frame that for potential employers. Answering this question speaks to what it is you excel in. What is your value proposition as a physician? Your strengths will portray exactly what you can bring to an organization. What are your personal (and professional) values? What is the personal framework that shapes the decisions you make, how you behave, and how you react to the world around you? Are you just looking for a job, or are you trying to find an opportunity that allows you to live in alignment with those values? If you have clarity on what makes you happy and energized versus the things that frustrate you or slow you down, then you are better prepared to recognize an opportunity allowing you to live in alignment with those values. Where do you ultimately want to be? To define who you are at any given moment, it is important for you to understand where you want to be – From where you want to live, to where you want to practice, to how you want to practice. Keep in mind, as you experience changes in your life or career, these needs and goals will evolve, and you will likely want to reassess during these moments of change. Once your physician brand is defined in your own mind, it is up to you to make sure you represent your brand to your audiences. This includes your digital footprint and how your present yourself in-person. We will be covering how to sell your candidate brand, both digitally and in-person, in the near future. Stay tuned! If you have any questions, use the contact form below, and we’ll put you in touch with one of our industry experts.